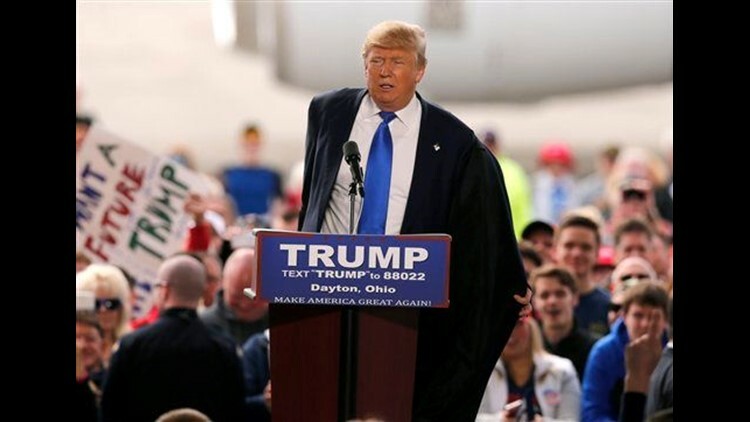 VANDALIA, Ohio (AP) — Republican presidential candidates Marco Rubio and John Kasich suggested Saturday they may not support Donald Trump if he becomes the GOP nominee, as violence at the front-runner's rallies deepened the party's chaotic chasm. Tensions ran high at Trump's latest rally, when Secret Service agents briefly formed a protective ring around the presidential candidate, then left the stage and allowed him to continue speaking at an airport hangar outside Dayton, Ohio. Trump's campaign said the agents rushed the stage after a man attempted to breach the security buffer. The man was "removed rapidly and professionally," spokeswoman Hope Hicks said. A defiant Trump has denied that he has encouraged violence at his events. But the scenes from his aborted rally in Chicago on Friday night appeared to be a final straw for some rivals who had pledged, despite deep concerns about his qualifications, to support the billionaire businessman if he were to become the nominee. Rubio told The Associated Press that Trump is driving apart "both the party and the country so bitterly" that he may not be able to support the billionaire if he's the Republican nominee. "It's an ongoing pattern," Rubio said. "And it's clear to me that he knows what he's doing." Kasich, the Ohio governor, said the "toxic environment" Trump is creating "makes it very, extremely difficult" to support him. The extraordinary shift by the two came just a few days before Tuesday's elections in five delegate-rich states, including their home states of Florida and Ohio. The only candidate to stand by his pledge to support Trump if he becomes the nominee was Texas Sen. Ted Cruz, who is closest to the businessman in the delegate count. "I committed at the outset, I will support the Republican nominee, whoever it is," Cruz told reporters Saturday. President Barack Obama, speaking at a Democratic fundraiser in Dallas, said those who aspire to lead the country "should be trying to bring us together and not turning us against one another." He said leaders should also "speak out against violence"
Trump insisted he'd done nothing to exacerbate tensions, despite having previously encouraged his supporters to aggressively — and sometimes physically — stop protesters from interrupting his raucous rallies. Trump told CNN late Friday: "I don't take responsibility. Nobody's been hurt at our rallies." He did several interviews as cable networks broadcast footage of the skirmishes both inside and outside the Chicago arena where he had planned to speak. At the event near Dayton, the audience chanted Trump's name as agents rushed the stage. Trump did not explain what had happened, but said: "Thank you for the warning. I was ready for 'em, but it's much better if the cops do it, don't we agree?" Trump also had stops scheduled Saturday in Cleveland and Kansas City, Missouri. The brash billionaire's unexpected political success has roiled the Republican Party. Most leaders expected his populist appeal would fade as voting contests began and largely avoided criticizing even his most extreme comments out of fear of alienating his supporters. But after 24 primary elections and caucuses, Trump remains the front-runner and leads his rivals in the all-important delegate count. GOP leaders are grasping for a last-ditch idea to stop Trump from claiming the nomination. They've talked about a contested convention and about whether to rally around a yet-to-be-determined third-party candidate. All are long shots at best and would probably rip the Republican Party apart. Rubio and Kasich must win their home state contests Tuesday to stay in the race and try to chip away at Trump's delegate lead. The chaos in Chicago was sparked in part by Trump's decision to cancel his rally after skirmishes broke out in the crowd that, unlike past Trump events, was packed with protesters — many of whom had organized ahead of time with the intent of keeping Trump from speaking. Many anti-Trump attendees had rushed onto the floor of the University of Illinois at Chicago Pavilion, jumping up and down with their arms up in the air after the event was called off. Some isolated confrontations took place afterward and police reported arresting five people. As Trump attempts to unify a fractured Republican Party before Tuesday's slate of winner-take-all primary elections, the confrontations between his legion of loyal supporters and protesters who accuse him of stoking racial hatred have become increasingly contentious, underscoring concerns about the divisive nature of his candidacy. Associated Press writers Kathleen Ronayne in Sharonville, Ohio, Tamara Lush in Tampa, Florida, and Darlene Superville in Dallas contributed to this report.